A small white church in the rural end of Sebago, in a section called Convene, is the home of the Sebago Historical Society whose members are eager to share how the town has grown from the earliest wooded forests, to a bustling tourist retreat of the early 1900’s, to the community of today, serving a variety of families including those who have been here for generations, younger beginning families, commuters to the greater Portland area who love returning to “the quiet side” of the lake after a busy day of work, those who love the area and have chosen to retire here as well as those who continue to return as seasonal visitors. 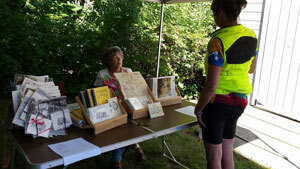 The Sebago Historical Society was formed in 1976 in response to a wave of new interest in town history at that time. The town of Sebago was incorporated in 1826, so the year 1976 marked 150 years of town history. Since that time, the Society has worked hard to live up to its mission of promoting interest in the history of the town by collecting historical artifacts, maintaining a collection of Sebago memorabilia, organizing special events, hosting educational programs, arranging tours of historic homes, creating annual Calendars, documenting town cemeteries, and participating in important town events such as the creation of the Veteran’s Monument and the summer festivities of Sebago Days. 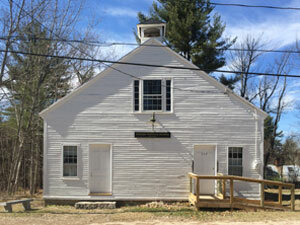 In ten year’s time, 2026, Sebago residents will celebrate two hundred years of town history. The Sebago Historical Society is prepared to help the community celebrate its past, enjoy the wonderful resources of the present day, and look forward to a future full of promise and opportunity! This is a summary of a more complete article on the development of the Sebago Historical Society, from 1976 to the present day, written by past president, Ann Burns. See the full article here. To encourage and promote an interest and appreciation of the history of the Town of Sebago through the collection, research, and preservation of such information, materials, or items and to develop educational programs of historical or genealogical importance relating to Sebago’s history. The Sebago Historical Society moved into its current location on Convene Road in 1996. The building, dating from 1844, used to be the old Freewill Baptist and Nazarene churches, and now houses a collection of artifacts and records relating to Sebago's history. The Society's museum and collections are open on the second Saturday and fourth Sunday of June, July and August from 10am to 2:30pm. Visits can be scheduled by appointment as well. These are some of the programs and events that the Sebago Historical Society (SHS) organizes, sponsors or participates in throughout the year. SHS Historical House tours – a summertime highlight! One of the projects that is unique to the Sebago Historical Society is the production of an annual pictorial calendar focusing on an historical aspect of life in Sebago. Annual themes have included the history of the schools, churches, fraternal organizations, and inns and hotels in town. The information provided in these calendars is the result of research work conducted by members of the Society, and the calendars provide a great starting point for anyone interested in Sebago history. Copies of the printed calendars are available for sale, and discounts are possible for multiple copies. See the Calendars page to view past calendars. The Board meets once a month, on the third Wednesday of each month, at the Society's Building on Convene Road in the warm months, and at various locations during the winter. Members are always welcome to attend. Contact us for details of coming meetings. See our current bylaws here. The bylaws are being revised and updated, and the final version will be posted here soon.